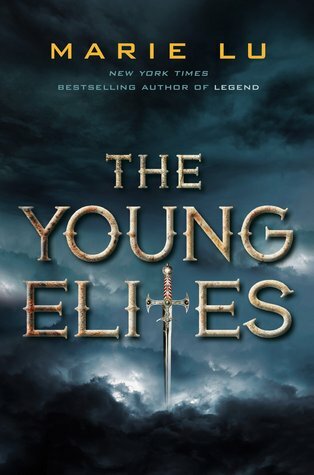 It feels like quite some time since my last young adult fantasy, and THE YOUNG ELITES certainly hits the spot. The book gets it right with its complex cast of characters and steady momentum. Although I wish the world building was more expansive, and that we got to see more facets to Adelina’s characters – it was still a promising start to a new series. I felt The Young Elites played with a lot of common YA tropes, and while it successfully subverted some of them with finesse – it also stumbled on others. In The Young Elites, a small portion of the population has been decimated and forever changed by a blood fever several years ago. It left the survivors marked by those special Mary Sue physical traits: hair in strands of sapphire and red, colourful skin disfigurement, impossible eye colours, or in Adelina’s case: a cascade of silver hair. While in other fantasy novels, these traits may be viewed as desirable or physically attractive. In The Young Elites – the cursed are named malfettos. They are marginalised and feared. The fever also gifted a smaller portion of its survivors with special abilities: whether it’s to call upon wind or weave illusions. While the superpowers might sound awesome, our heroine’s manifestation of powers come at a price. Instead of being propheted to be the chosen one, destined to bring down despotic regime and rulers – Adelina’s ability ties her to darkness and chaos. Of all the energy in this world, she has the strongest affinity for fear and fury. Whenever Adelina exercises her powers, she is enhanced by these emotions – while at the same time being consumed by them. She’s certainly no plucky, winsome heroine that stumbles upon her destiny. Adelina’s path is muddled, and while I would hesitate to call her villainous – she’s certainly more complex than your garden variety main character. Yet, Adelina still played at the confused, uncertain and angsty teenager throughout most of the book. I felt she never reached her potential as a character. I hope to see her embrace the darkness more thoroughly in The Rose Society. You know how it is with YA paranormal and fantasy, I have come to expect romantic polygons as a part of the deal. Thus, when Adelina is introduced to Enzo with ‘eyes as dark as night’, and Raffaele – who’s beauty is likened to the moon – I braced myself for the love triangle. Mercifully, it never came. Raffaele reminds a confidant to both Enzo and Adelina, and if anything – he has more romantic chemistry with Enzo (I totally ship them *ahem*). I love Raffaele’s character, who despite being physically weaker and the prettiest of the bunch – still holds a lot of power due to his ability to manipulate emotions. He’s certainly someone I wish to see more of in the sequel. It was so refreshing to see his relationship with Adelina, as not many male-female friendships in YA remains entirely platonic the whole way through. On the other hand, I wish we got to see more of Enzo and his fire. I figured Enzo was kept at an emotional distance on purpose, due to later events in the book – but I wish we got to see more of his personal motivations. His character consisted of a lot of smoldering and posturing, and while he got some ‘back story’ in the form of a dead former lover (urgh, don’t you hate that trope?) – we never saw much of his more human side. I felt that I could not connect to the rest of the Dagger Society either, again, this is because they held Adelina at arm’s length. Yet, I love crews and banters and I wanted more! Through the whirlwind, I hear my father’s harsh whisper. I know who you really are. Who will ever want you, Adelina? One of my favourite aspect of The Young Elites is the relationship Adelina has with her father and her sister. Her father is a real piece of work, at once sadistic and manipulative – he’s personally responsible for twisting Adelina’s mind. However, I liked that the book wasn’t entirely clear cut with Adelina’s feelings for him – while she despised him for his cruelty, she also yearned for his approval, even long after his death. I also really liked the conflicted feelings Adelina had for her sister, who unlike Adelina was cherished all her life. Their relationships reminded me of the one between Nyx and her sibling in Cruel Beauty. While I enjoyed to pseudo-Italian Renaissance setting we had in The Young Elites, the world building was incredibly shallow. We are told there are numerous nations, yet there’s no distinct marks between them. Actually, I can barely tell you the names of the the different kingdoms, that’s how bland and homogenous they were. On the other hand, the wider conflicts presented between the malfetto and the ‘normal’ citizens made for an interesting larger plot – and I can’t wait to see more of it in the future. Overall, The Young Elites is a great start to a dark fantasy series. I feel that the world still needs to find its feet and develop both the settings and its characters to their full potential. I will definitely be checking out The Rose Society in the near future. Man, I really love your reviews! They are so intense and in-depth! I am so invested in Adelina’s character arc. I need to pick up the sequel. I remember reading that the author wanted to try writing an anti-heroine/Darth Vader type character so Adelina emerged. Ditto crew banter & shipping Rafaelle + Enzo together! I hope Rafaelle receives a requited love someday because he is one of my favourite characters. I loved Legend trilogy, but haven’t been able to read this. I never read any book with villain as the main character, so I’m really curious how this would turn out. I love how detailed your review is, give me so much insight about the book. Amazing review! Thank you! I am glad the review gave you some details on the book 🙂 I wouldn’t say Adelina is an outright villain, but her arc is very interesting! I hope you’ll enjoy it as much as I did!! That’s a real shame about the world building. But maybe you’ll get more in the sequel? Hopefully! Anyways, I’ve been wary of this series because I was unhappy with the way Lu ended her dystopia series. So I’m waiting for the last book to be out so I can decide if I’ll like it or not. I do like the sound of the characters and anytime there’s no love triangle I’m all in. I hope to see more of the worldbuilding and these characters in the sequel as well! Sorry to hear that the Legend series ended on a bad note for you, I personally haven’t read it myself yet! I read this book on Kindle, so I can’t recall a map — even if there was one it would be been very basic, there is basically a kingdom at the top, a kingdom at the bottom, and some island in between by the sounds of it XD Still worth checking out for the characters though! HOORAY. I really enjoyed this book, especially how dark it was. So refreshing! I agree with the worldbuilding part – as you mentioned, I felt like they were names pulled out of a hat with not much significance other than to give this facade of depth. But that ending though – I really should pick up The Rose Society. 😀 Great review, as always! I really loved the ending, excited to see more characters and kingdoms in Rose Society, most reviews have been really positive so fingers crossed! I loved your review ! I need to buy the Legend trilogy though. Oh and I’m in awe with your illustration ! It’s really gorgeous ! I remember liking this, but it was sort of a let down after being so pumped up to read my first Marie Lu book! I just remember it being rather typical of the genre, which isn’t always bad! I figure I’ll give book two a shot one of these days. Aw, thank you so much for stopping by! 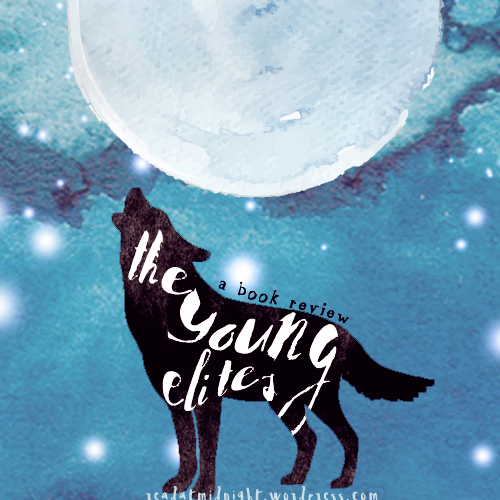 Complex characters, a conflicted heroine, and special abilities, there is so much goodness in the Young Elites! I just ordered this one from TBD and I’m really looking forward to reading it, I’m so glad you enjoyed it Aentee! This sounds like a pretty great series starter. The young elites sound like they could have a pretty interesting group dynamic. Have you read Marie Lu before? I never have, but I’ve heard some very positive things about her. This actually sounds like a really great read! I was kind of hesitant to pick it up because I haven’t read anything by Marie Lu and I’ve heard some mixed things about her Legend trilogy. But The Young Elites sounds amazing! The Renaissance-inspired setting definitely appeals to me, so it’s kind of sad that it wasn’t taken further. But everything else you mentioned, I think it’ll really love! And thank god for the absence of a love triangle!… Raffaele sounds like a really awesome character though! I hope you’ll enjoy this one when you get around to reading it, Kells! The slight changes from the usual narrative in this book was incredibly refreshing. I’d been wanting to read one of Marie Lu’s books, especially since almost everyone has been fawning over The Rose Society lately! It’s lovely to hear that there are complex family relationships but it’s a shame to hear the world building fell short. I felt the same about The Selection. Beauty likened to the moon, though? Raffaele seriously sounds super cute! 😀 Lovely review, Aentee! I seriously recommend it, Raffaele looks cute and wonderful but will actually not hesitate to eliminate you if you’re troublesome. AKA HES THE BEST. Wasn’t this one great? I loved it so much – and The Rose Society, I REALLY enjoyed it! It’s interesting to experience a novel through the mind of a nontraditional heroine – Adelina gets even more twisted in book two. o.o I can’t wait to read book three! An epic conclusion to come, I’m sure! I hope we both enjoy The Rose Society! !